"What we planted did not grow." In 2016, from Syria to Brexit, a multitude of news stories have competed for our attention. But even in this context we have to ask why the food crisis in Eastern and Southern Africa has received so little attention. The United Nations estimated in May that drought had put 31 million in need of food aid, and that this would rise to almost 50 million people by the end of the year, across 13 African countries. In these countries, children have been hit the hardest with 1.2 million under the age of 5 suffering from acute malnutrition and 25 million at risk of malnutrition, water shortages and disease. Why has the situation been so bad this year? El Nino is a natural phenomenon which happens every two to seven years and can last up to 18 months. As sea surface temperatures rise in the eastern Pacific Ocean, there are impacts on weather around the world, with some areas drier, others wetter. To Eastern and Southern Africa it brought severe drought. Now El Nino has ebbed away, but hunger remains until the spring harvest. Urgent help is also needed to ensure farmers have seeds to plant, or they will not be able to harvest. Later in the year the counter phenomenon, La Nina, is likely, bringing rains which may help agriculture: but which may also bring damaging floods. This has been a particularly strong El Nino. Does climate change make El Nino events stronger? The science is not clear. We know that one aspect, the high temperatures in the past year were primarily driven by climate change, with only a small proportion attributed to El Nino. What is clearer is that in many areas now struggling, food production was becoming more difficult even before El Nino because of climate change. The climate in these regions is becoming less stable, the rains less predictable. With the normal rain cycles disappearing, there are fewer resources to draw on each time severe drought or flood come: and this means more deaths. This year's El Nino is not a one-off, it is part of a longer story, following previous droughts and floods and with the knowledge that 'normal' is fast disappearing. Below are some stories from some of the countries affected drawn from different sources - please go to the original to read more. Two consecutive seasons of droughts have hit Southern Africa, this year's being the worst in 35 years. Widespread crop failure has exacerbated chronic malnutrition in the region. More than 640,000 drought-related livestock deaths have been reported in Botswana, Swaziland, South Africa, Namibia and Zimbabwe alone. Food shortages are expected to peak during the lean season between January and March 2017, the FAO warned. In Malawi, 2015 saw double disaster. In the rainy season of 2014-15, heavy floods hit the southern region. People had to flee their homes and crop fields were washed out, leaving the soil without seeds to plant in the coming season. Floods then led into droughts. This year, again, rains did not come, and grain stores are empty. 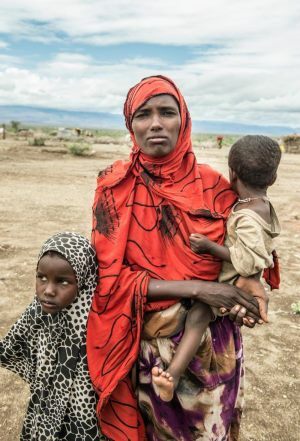 the majority of people interviewed by Oxfam in May 2016 in drought-affected areas reported only having one meal per day, and were expecting not to have any food to eat by August. Photojournalist Sebastian Rich documented two mothers in Malawi struggling to feed their children. Alinafe is pictured right with her children around a meal of dried peas, her youngest daughter, Desire, is getting treatment for malnutrition. But another single mother, Makia, aged fifteen with four children was in worse straits. Hunger had left the family too weak to reach the nearest clinic, and they were surviving on water-lily roots with no nutritional value. Across Southern Africa, even for those who had resources before the drought, hopes for the future are put aside in the struggle to survive. The picture on the right is of Aisha Nor, holding her two-year-old daughter Hawa who had just been diagnosed with Severe Acute Malnutrition. The government states that 25,000 children were treated for severe malnutrition in January alone. The family’s cattle died in the drought, and Aisha's husband is bedridden and disabled. By gathering dry twigs from the scrubland around her home and selling them at market, she can earn just enough to buy sweet black tea to supplement her children’s daily bread ration, hoping that will be just enough to keep them alive. While rains have now improved the situation in some areas, in others the soil is still dry. The FAO reported in June that 1.7 million households lack seeds to plant. Families who have lost the majority of their livestock will take years to build herds up again, and animals that survived the drought are still weak and susceptible to diseases during the rainy periods. The rains also bring their own risk, with floods displacing people and blocking the delivery of food aid. Read more. In Kenya, the north-west region has suffered severe drought this year, while torrential rains had brought flash floods to other parts of the country. During a previous drought in 2011, film maker Julia Dahr visited Kenya. Over four years she filmed Kisilu and his family as they experienced drought, floods and storms, and Kisilu worked with his community to build their resilience in the face of climate change. The 47 minute film gives an idea of both the difficulties climate change brings farmers and the personal story of someone determined to make a difference - it is worth watching. Finally, off the southern tip of Africa, Madagascar is another country that has been hit both by severe droughts and devastating floods because of heavy rains. It is also exposed to cyclones, which are expected to intensify with climate change. In 2015 there was tremendous, unprecedented heavy rain, which flooded 60% of the capital city, causing landslides. Then, in March, heavy storms destroyed harvests in the north, while in the south there was no rain at all. In 2016, drought in southern Madagascar has led to widespread child malnutrition. Many have escaped to the coastal city Morondava. But climate change threatens homes there too with floods and cyclones. "Black Lives Matter" has been a rallying call across the US and beyond. Can we also break through the silence about the toll of deaths and suffering from our failure to act on climate change? Now we know the consequences, every decision to build fossil fuel infrastructure rather than renewables, to carry on wasting the energy we burn carries an implicit message: black lives do not matter. The first step is to speak about the impacts of climate change now. Too many people still see our changing climate as a future risk, not a day to day reality. And we need to hear the voices of those affected. Behind the statistics are real people losing their livelihoods, unable to feed their children. Please share this page on Facebook or Twitter to raise awareness. If you want to help get food to those in need right now, Unicef and other aid agencies are appealing for funds. Longer-term funding for climate change adaptation is also vital. This can allow millions of families dependent on subsistence farming to grow crops and access drinking water even in a changing climate. This transfer of funds from countries responsible for the majority of climate change to those in the frontline of the impacts is an important part of international climate change negotiations. So far just a small proportion of funds promised have actually been paid. In the UK, the future direction for the Department for International Development under the new minister Priti Patel, is uncertain. We must make sure that our global climate change responsibilities are not avoided. Humans are versatile. They move, they adapt, they do what they can to survive. But for those with fewest resources, and who have done least to cause the problem, climate change is tilting the odds away from them, making every decision more risky. With the window closing to prevent much worse climate change, we cannot afford to look away.